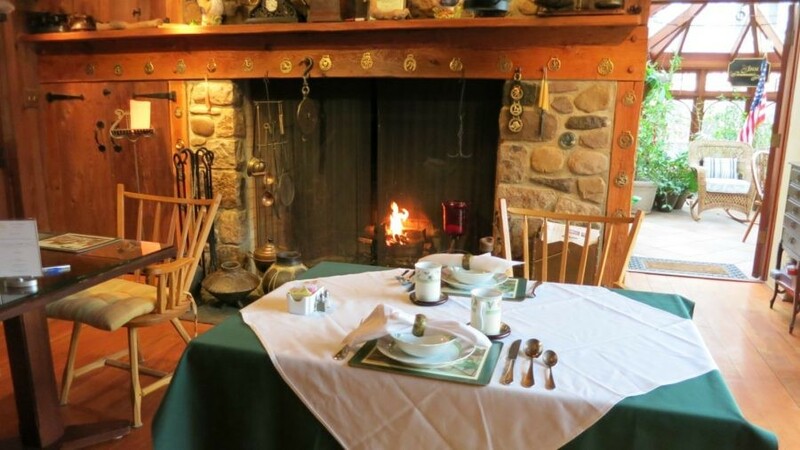 If you are expecting a child and live within a few hours drive of Buck’s County PA, there is no better place to savor your Babymoon than the Inn at Bowman’s Hill. Why? Besides the obvious – being catered to in what amounts to a rich uncle’s backcountry estate for couple of days – you will find one unique and comforting amenity. You can arrange for a professional pre-natal massage, performed by a therapist from a local doctor’s office, who arrives at your guest room with her own massage bed and oils for an hour long sublime and pain-eliminating rubdown. Heaven. A Babymoon is but once special reason to come here. There are hundreds more. A Four Diamond property that excels in spoiling guests, it’s no surprise that even locals book a room or suite here. Many visitors just hang around to Zen out by the calming landscaped pool, or bring bikes to cycle the 18 miles down the New Hope Canal Path, across the Lambertville Bridge to Washington Crossing and back to the inn. Out of town, on an undulating road of farms and mansions, this Inn is a serene escape in every sense. 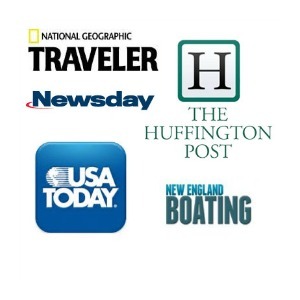 (See this Getaway Mavens post for more about what to do in the area). The 5-acre property is exquisite, with plantings, flowering trees (some, unfortunately lost to Hurricane Sandy), and a heavenly heated pool. 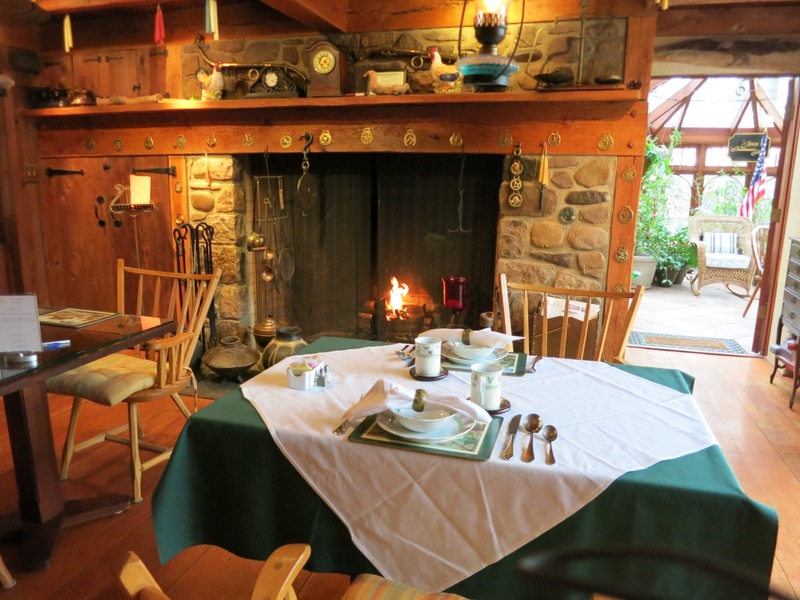 Guests first walk into what appears to be a cozy fire-lit (in winter) Colonial Tavern where Amery greets guests before showing them to their rooms or suites. He’s got connections with everyone in town it seems, so if you’d like a table at one of the area’s best restaurants, Amery can oftentimes make it happen. He’s got a big heart and really, really wants to make your stay as wonderful as possible. To that end, Mike will keep you company or leave you alone – just the right balance of effusive service and privacy one would expect from an inn of this caliber. Four rooms are stunning and elegant, with traditional European-Country furnishings and feel. Several offer double French doors that open onto small decks. Each room is stocked with complimentary snacks (not a pricelist in sight), cold water bottles and a Keurig coffee maker. All posh suites – decorated in early Lord and Lady of the Manor – are larger than most NY City apartments. Enormous marble bathrooms sport double and triple glass rain-showers, golden fixtures and Jacuzzi baths. The Tower Suite features sponged walls, cathedral ceiling in sitting room, two flat screen tv, and upstairs, high-end linens on a fine king featherbed. The George Washington Suite, one of the newest, is, in its masculine palette, the type of room to which men might retreat to light up a stogie or two. Newlyweds or hopeless romantics will want to book the new Penthouse Suite – another multi-level room with a very unique feature in the bathroom. Above the corner Jacuzzi is a trompe l’oeil twinkling-star night sky, a perfect accompaniment to champagne and chocolate dipped strawberries. 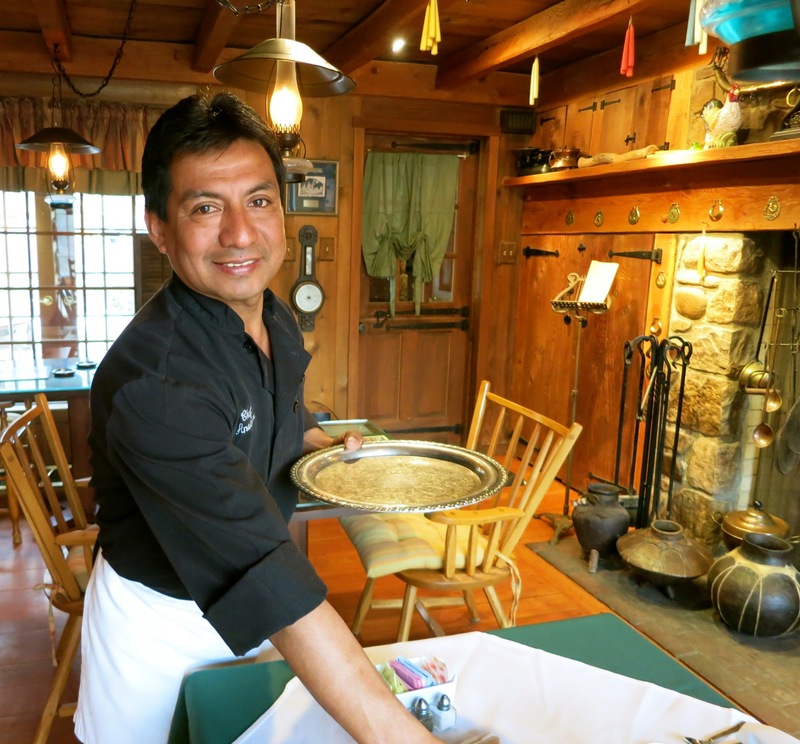 In-house chef and right hand man, Anastacio Olivera, whips up a three-course gourmet breakfast each morning, which you can eat en suite, in the solarium, on one of several outside patios or in the “tavern” room. I was impressed by Olivera’s crispy, lightly stuffed French Toast, which I enjoyed with fresh fruit cup and a tall glass of blueberry-pomegranate juice in front of a real woodburning fire. Complementary bags of chips and crackers and bottles of water are available round the clock. On hot summer days, you may want to just lounge by the pool outfitted with a blessed misting system, and, when the cravings strike, ask Mike or Anastacio for ice-cream (with or without pickles). Amery also has an agreement with several professional massage therapists (from a local doctor’s office) who will come to your room with a comfy massage table (or two for a couple’s massage) and work the kinks out of your aching muscles. 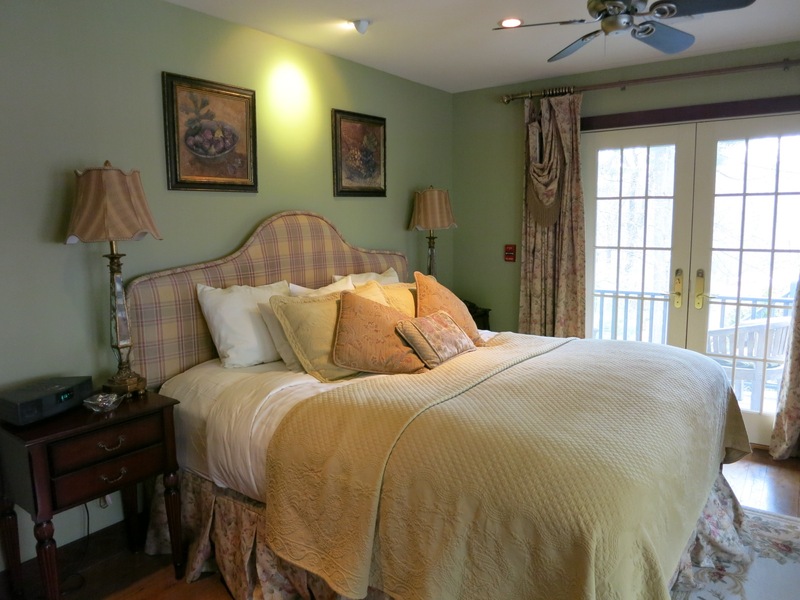 Some specialize in pre-natal massage, rendering a weekend at the Inn at Bowman’s Hill the perfect Babymoon. Private in-room massage $130/hour. Rooms ($405-$495) and Suites ($505-$625) include gourmet breakfast (using fresh-from-the-chickens-out-back eggs), free wi-fi, snacks, bottled water and parking. Though the author was hosted by the Inn at Bowman’s Hill, this is not a sponsored post. All opinions and observations are expressly her own.